Dragon's breath is an extremely volatile substance that can create incredible flames when it comes in contact with air. The pawn shop owner, Terry, offers Sam and Dean dragon's breath when showing his supernatural wares, which the brothers decline. 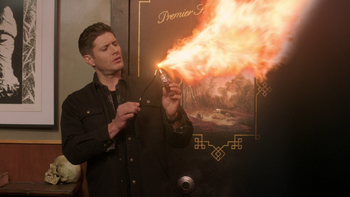 When they reveal they are looking for the skull of Sarah Good, and tell Terry they know he murdered a hunter named Bart Kemp to get it, Terry takes the perfume bottle of dragon's fire and uses it to spray a large flame at the Winchesters, causing them to get knocked to the ground. After killing Terry, Sam goes through his ledger of supernatural objects while Dean inspects the dragon's breath bottle. Squeezing the perfume bottle's atomizer causes a large flame to shoot out, which startles both brothers. They decide to take the dragon's breath along with everything else in Terry's shop to the Bunker. This page was last edited on 23 February 2019, at 18:56.